With his head held high and that jaunty trot the Shih Tzu could easily be perceived as a haughty little dog. In reality – nothing could be further from the truth. The true Shih Tzu personality is one of the best around. The Shih Tzu is a charming little dog who can win over almost anyone he meets. Rugged of body and mind in comparison to most other toy breeds. A friendly dog to all, young and old alike, the Shih Tzu will not differentiate. As long as the dog is socialized well from puppyhood. The Shih Tzu will have developed his natural trust in people, inclusive of strangers; he will greet everyone he meets with politeness and often enthusiastic friendliness. If he is bought up with care then the Shih Tzu will be more than happy to be handled and passed around by gentle, supervised and respectful children. He enjoys nothing better than being in a lively home and at the center of attention. 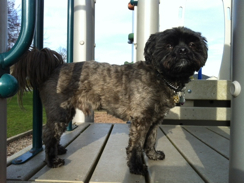 Equally though the Shih Tzu personality makes him a fabulous addition to an all adult or elderly home. He would be quite happy as the companion to a single person and sit gratefully on a sofa or lap for most of the day. The Shih Tzu is happy to share his space with other dogs and even cats. Many homes have multiple dogs of the breed. He will also be friendly to dogs and other animals whilst out and about. In fact he is quite social and enjoys canine contact nearly as much as he loves being around his special person and family. Unflinching loyalty is a big part of the Shih Tzu personality. He will adore his human family and enjoy being with them. He likes nothing better than a cuddle. If he should have to decide between undivided attention and a walk in the rain I am truly not certain which he would choose. Along with loyalty comes a slightly darker side of the Shih Tzu personality. This little dog can become quite protective of his home and family. He has certainly been used as an effective guard dog in some instances. This added trait is quite unusual in toy dogs. But then The Shih Tzu is completely unaware of his size. Bright as a button and equally quick the Shih Tzu is extremely trainable. Although I say this, first of all you need to get to know the breed; he has his own special view of the world. Where some dog’s, for example the collie, learn for the love of it the Shih Tzu personality naturally asks why. After he has asked why the little dog will then question what he will get for learning. He has not been bred for learning tricks and he knows it. The Shih Tzu is well aware that his bloodline is special. He was after all a gift for Royalty and is also rumored to have been the true companion to Buddhist monks throughout history. He does not actually care what you would like him to do, unless you have something motivating to show him then a reward to give him after he gets it right. He can certainly be stubborn if not properly motivated. He is a clever dog, despite any blank look you may receive from his comfy spot on the sofa. The intelligence is there, believe me, and pull out a tiny tasty treat to see it for yourself. The Shih Tzu likes food. He can easily, if allowed to, become overweight. So it is important to watch his intake carefully. He may have a tendency to scavenge too if something tasty arrives on the ground before him. They have even been known to knock over a kitchen bin. Food is a great training motivation for the breed. But be careful you don’t fall into the trap of feeding him for everything. He is clever enough to start refusing until he has seen the reward. The Shih Tzu is a lap dog, He loves a cuddle and to be held. This physical contact is often the way he wins people over. Tenaciousness is a massive part of his charm. The usual Shih Tzu personality is not keen on too much exercise; he would prefer to be at home on the sofa than out in anything other than the perfect temperature. The inclination to revel in personal contact can leave you plucking him off you each time you want to move. But don’t resist his affection too often because he can become easily offended and will bear a mild grudge. He is, after all, the center of your universe. In his eyes at least. totally free newsletter below and get amazing tips sent directly to your inbox! With his head held high and that jaunty trot the Shih Tzu could easily be perceived as a haughty little dog. In reality - nothing could be further from the truth.